NOTE FROM CATHY: The following is a guest post.Enjoy! Dogs with a lot of hair usually need grooming, but that’s not exclusive to them. A groomer can work wonders on your pooch by refreshing their haircut and untangling any mess that may occur. However, regular visits to the groomer may get expensive so why not learn how to groom your dog at home? If you’ve never done it before, don’t worry, it’s not as scary as it sounds. 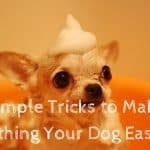 If you follow the tips and tricks mentioned below, you’ll be having your dog looking brand new without spending too much. 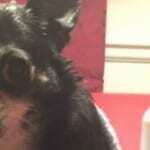 If you know your dog is not a fan of bath time, then an extra helping hand would be another thing to put on the list. Before you do anything in your bathtub, make sure that you thoroughly give your fur baby a good brushing. 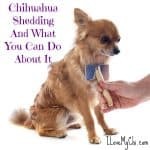 You want to untangle and remove as much debris as possible from your dog’s coat. While brushing, you’ll start to notice areas that may need more attention while washing. 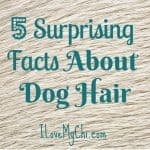 For example, if you have a long-haired dog, they’ll need attention to the hair on their tails and tummy. In addition, the right brush can really make a difference when it comes to your dog, so make sure that you choose a brush which suits their fur/hair type. For longer coats, you’ll want to use a slicker brush while for short smooth coats, opt for a rubber brush. While brushing, take your time and make sure that it’s not hurting your dog. We’ve all seen the movie, Beethoven. That was a pretty good rendition of what not to do while giving your dog a bath. Before anything, make sure your dog isn’t hyper. If he or she is, you want to calm them down by patting them slowly and speaking to them in a peaceful tone. There aren’t too many dogs who love bath time, so by being calm yourself they’ll catch on to this energy. While you’re bathing your dog make sure you don’t forget their ears. Since you already have them in the bathtub, this is a great opportunity to use an ear cleaner and get this done at the same time. There are tons of ear cleaners on the market but you want to make sure that you’re using the best dog ear cleaner for your pooch. Remember the list of equipment you’ll need? A hair trap was one of them and for a good reason. 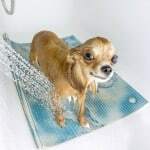 If you have a dog with long hair, you’ll want to make sure that bath time won’t result in a clogged drain. You can buy a hair trap from any home hardware store or you can use steel wool to make sure their hair stays out of your drain. Though your shampoo smells like mango, don’t use it on your pooch. It’s not that you can’t have your dog smelling like an exotic fruit, you can, but you’ll need to buy a pet-specific shampoo. This is because humans have a different pH than dogs. So, using regular shampoo could cause irritation and rashes, two things you don’t want. Ask your vet what shampoo would be best for your dog depending on what they need. If your dog has skin problems, they’ll need a therapeutic shampoo. While bathing, make sure you massage the shampoo into the coat – this will also give them a relaxing massage. After you’re done bathing your dog, they’re going to be standing there, soaking wet. You’ll want to have three towels ready to use. One towel you’ll have on the bathtub floor so that they don’t slip. The second towel you’ll be using as an anti-shake towel, so when you’re done washing your dog, place the towel over their body and they won’t shake. Lastly, the third towel is your drying towel. You may need a couple more towels to dry them off. Some dogs, after a bath, tend to have dry noses and paws. If you’re wondering how to make their noses and paws back to their soft selves, here’s an easy trick you can do that they’ll love. With your finger, dab a little bit of coconut oil on their nose and paw pads. 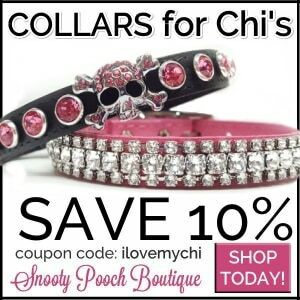 It’s dog-friendly, tasty and will help heal and soothe those areas. You can towel dry your dog but if you want to speed up the process, then use a hairdryer. It’s a great way to get your dog dry before they run through the house, shaking their wet bodies onto everything they see. Make sure that you use a low setting on your hairdryer and keep it at a further distance from your pooch so you don’t burn them. However, if they’re freaking out because of the hairdryer, then just go back to using the good ol’ towel dry. Well, your dog is your baby, right? So, if you find your baby over excited about bath time or maybe a little nippy, then distract them by using a bath toy. They’ll be able to redirect their attention on that and you’ll be able to continue bathing them without any problems. 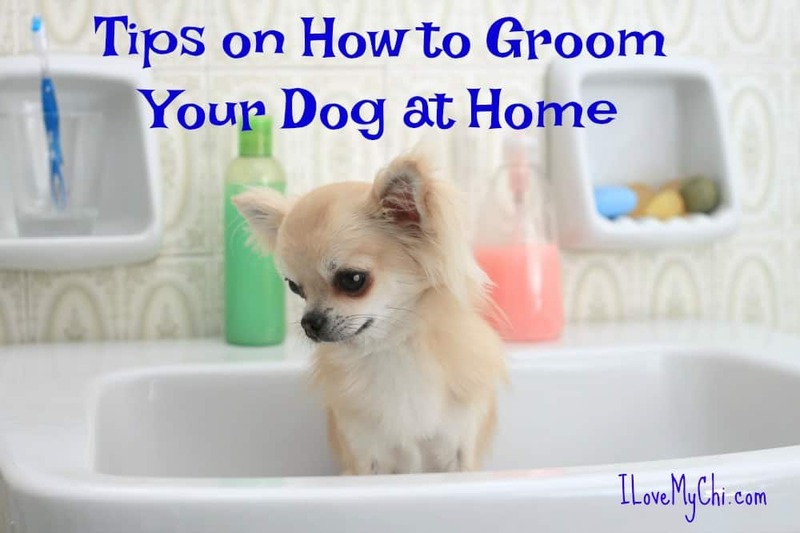 Now that you know these helpful tricks, the next time you groom your pooch use them! 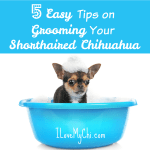 You’ll be amazed at how much easier these tricks & tips will make your next grooming session. 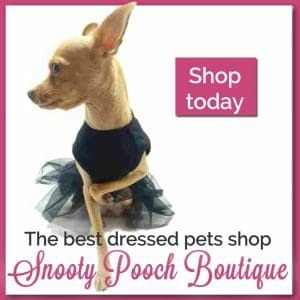 Who said grooming your dog had to be hard? Anna Smith resides in beautiful Santa Monica, CA, where she works as a Pet Nutrition Expert in a leading retail pet store. She is responsible for nutritional strategies for different breeds and development of new products on the market in compliance with Association of American Feed Control Officials. 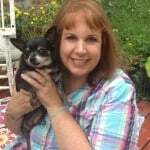 Anna’s passions are education about proven methods and best practices in the industry and her dog Max, who is always well-fed. She also curates content for http://dogsaholic.com/. My fiance and I got a new dog named Boomer and we are excited to start grooming him. I have already bought some pet gloves for grooming. Along with all the preparation, we have made we will keep in mind the trick to distract him with a bath toy. Thanks for visiting Alexandria and good luck with Boomer. LOL, yeah that tends to happen a lot.